There is a popular exhibit on the walls of the Kelley House Museum called “Then and Now.” Visitors are offered the opportunity to compare two framed photos of the same place, taken about one hundred years apart. You can see the bay-windowed Jarvis-Nichols general store on the corner of Main and Kasten Streets bedecked with patriotic bunting for the July 4th parade circa 1900, juxtaposed with the contemporary view of that building, now occupied by the Gallery Bookstore. You see other images of houses, mill sites, and panoramic views of familiar places from back then and from now. The take away from this entertaining history lesson is that around here, a lot of things have stayed the same, although not exactly. Consider the Kelley House. Renovations over the years have done a mostly faithful job in retaining this 158 year-old family home made from native redwood lumber. Old photos show elaborate dentil moulding and other fancy trim work, which is still there today, as are the original doors, floors and windows. But the Kelley’s, like most folks, added on and improved their lovely home over the years. One of the largest changes was the addition of a kitchen wing in the 1880s. Shortly afterward, an inelegant but serviceable storage shed was attached to the west end of the kitchen. It’s unlikely the builder was William Kelley, who was a skilled carpenter, because it was an awkward union. The shed’s roof is smack up against the wooden siding of the kitchen, and an odd jog where the roof meets the corner of the back porch has turned out to be an unfortunate design flaw. Fast forward one hundred years. The Kelley House has become a Museum and its historical research office now occupies the kitchen wing. And the shed, which still looks like a shed, has been transformed into the vessel that houses the stories of the Mendocino Coast — our Vault. 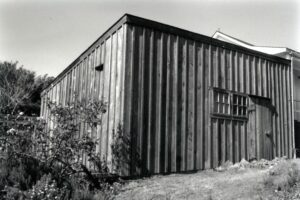 After nearly 20 years of collecting photographs, negatives, slides, paintings, historic documents and objects donated by descendants of early Mendocino families and coastal residents, the Kelley House was able to raise enough funds to build the Pioneer Families’ Vault, a climate-controlled and fireproof home for these local treasures. In 1993, it was finally completed and dedicated to founders Beth Stebbins and Dorothy Bear. The Vault’s design accomplished a sleight of hand whereby the new archival building appears to be the old one. This was done by cladding the modern concrete structure with the plank siding recycled from the original structure. Walking down Albion Street, what you see appears to be a rustic old shed. So it looks the same, but not exactly. Please see the two photos. The Vault contains over 10,000 items. Our oldest artifacts date from the early 1800s. It is also the repository of The Mendocino Beacon, containing its very first issue in October 1877 all the way up to the present day. In recent years, rainwater began penetrating that awkward junction where the roof and walls of the Vault adjoin the historic kitchen. Repairs have been made to this area, but the tipping point was reached this winter when heavy rains invaded the widening breach outside and produced a puddle of water on the office floor in front of the Vault door. In the course of exploring the extent of the needed repairs, we found additional points of entry outside where rainwater was seeping between the Vault’s perimeter concrete walls and its exterior wood plank siding because of the failing 26 year-old roof. These multiple issues may explain why we have recently been unable to get the Vault’s relative humidity, now at 64 percent, to within the archival standards of 30 to 50 percent. Controlling temperature and relative humidity is crucial for these kinds of collections. Inappropriate levels of either contribute significantly to the deterioration of materials. High relative humidity can encourage mold growth and pest activity. 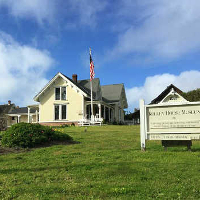 The mission of the Kelley House Museum is to collect, preserve, protect and share the rich history of the Mendocino Coast. It is crucial that we maintain the integrity of the Vault and its contents. And it will cost almost $10,000 to take care of this problem. A dedicated building fund has been set aside to deal with this urgent need. As of March 22, we have received a $3,000 grant from the Mendocino Rotary Club, $1,000 from Marion Bush, $500 from Tonia Hurst, and $206 from other generous donors, including Sydney Evans, Katy Tahja, Jane Tillis, Jeff Kan Lee, Frances Casey, Sarah Glaubman, Patrice Wagner, and Nancy Atkinson. Additional grants have been requested. 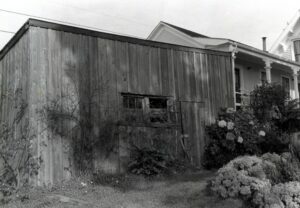 If you value the history of this unique place, we ask that you please show your support with a donation mailed to The Kelley House Museum, Attention Building Fund, 45007 Albion Street, Mendocino, CA 95460. You can also donate with a credit card or PayPal via our website kelleyhousemuseum.org, or call us at (707) 937-5791 or email curator@kelleyhousemuseum.org. We’d love to have your help.